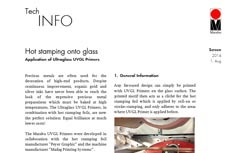 Marabu offers UV-curable and solvent-based inks for printing on glass touchscreens and touchpads. Moreover, the company has developed the new two-component MaraGlass MGLA for printing on second surfaces. It can also be employed for outdoor applications. 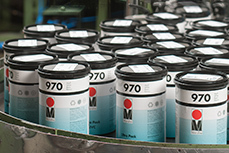 A broad range of inks are available for large format printing. Should users continue to buy OEM products – or explore third-party options? Marabu offers inks of the same high quality, often with even better properties, at a significantly lower price. The manufacturing of sensitive products such as foodstuffs or cosmetic packaging requires utmost awareness. Strict safety standards strive to ensure that human health is not put at stake by any of the ingredients. With UltraPack UVFP Marabu has a low migration ink that fulfils these requirements. Design freedom, cost savings or environmental protection - new solutions for glass designs are in strong demand, particulary for bottles, drinkware, and cosmetic flacons. But also decorated flat glass for interior applications is becoming increasingly important. 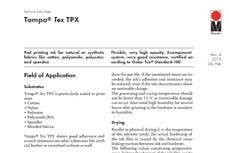 Solvent-based, UV-curable and water-based inkjet inks – for flexible, rigid and textile substrates. UV-curable liquid laminates can be used as primers, for finishing, as a protective coating or for colouring. At Marabu, we habe been brightening the world around us for years. 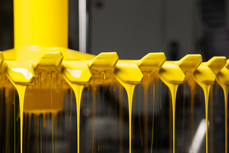 Since our foundation in 1859, we´ve been creating innovative inks for almost any application. Find the perfect ink solution for your specific application – whether it is graphical or industrial, screen, pad or digital. Marabu is your development partner for projects where the compatibility of the application is in the foreground. The focus: Digital printing on products that come into contact with human skin or foodstuffs. We have revised our screen printing table of inks and substrates. It is available as print and online version. Marabu is proud to announce the opening of a new branch office in Mississauga, Ontario.